> Nanoparticles (purple) carrying melittin (green) fuse with HIV (small circles with spiked outer ring), destroying the viruss protective envelope. Molecular bumpers (small red ovals) prevent the nanoparticles from harming the bodys normal cells, which are much larger in size. > Nanoparticles carrying a toxin found in bee venom can destroy human immunodeficiency virus (HIV) while leaving surrounding cells unharmed, researchers at Washington University School of Medicine in St. Louis have shown. The finding is an important step toward developing a vaginal gel that may prevent the spread of HIV, the virus that causes AIDS. > Our hope is that in places where HIV is running rampant, people could use this gel as a preventive measure to stop the initial infection, says Joshua L. Hood, MD, PhD, a research instructor in medicine. > The study appears in the current issue of Antiviral Therapy. Bee venom contains a potent toxin called melittin that can poke holes in the protective envelope that surrounds HIV, and other viruses. Large amounts of free melittin can cause a lot of damage. 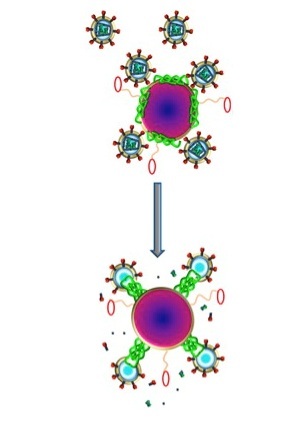 Indeed, in addition to anti-viral therapy, the papers senior author, Samuel A. Wickline, MD, the J. Russell Hornsby Professor of Biomedical Sciences, has shown melittin-loaded nanoparticles to be effective in killing tumor cells. > The new study shows that melittin loaded onto these nanoparticles does not harm normal cells. Thats because Hood added protective bumpers to the nanoparticle surface. When the nanoparticles come into contact with normal cells, which are much larger in size, the particles simply bounce off. HIV, on the other hand, is even smaller than the nanoparticle, so HIV fits between the bumpers and makes contact with the surface of the nanoparticle, where the bee toxin awaits. > Melittin on the nanoparticles fuses with the viral envelope, Hood says. The melittin forms little pore-like attack complexes and ruptures the envelope, stripping it off the virus. > According to Hood, an advantage of this approach is that the nanoparticle attacks an essential part of the virus structure. In contrast, most anti-HIV drugs inhibit the viruss ability to replicate. But this anti-replication strategy does nothing to stop initial infection, and some strains of the virus have found ways around these drugs and reproduce anyway. > We are attacking an inherent physical property of HIV, Hood says. Theoretically, there isnt any way for the virus to adapt to that. The virus has to have a protective coat, a double-layered membrane that covers the virus. > Beyond prevention in the form of a vaginal gel, Hood also sees potential for using nanoparticles with melittin as therapy for existing HIV infections, especially those that are drug-resistant. The nanoparticles could be injected intravenously and, in theory, would be able to clear HIV from the blood stream. > The basic particle that we are using in these experiments was developed many years ago as an artificial blood product, Hood says. It didnt work very well for delivering oxygen, but it circulates safely in the body and gives us a nice platform that we can adapt to fight different kinds of infections. > Since melittin attacks double-layered membranes indiscriminately, this concept is not limited to HIV. Many viruses, including hepatitis B and C, rely on the same kind of protective envelope and would be vulnerable to melittin-loaded nanoparticles. > While this particular paper does not address contraception, Hood says the gel easily could be adapted to target sperm as well as HIV. But in some cases people may only want the HIV protection. > We also are looking at this for couples where only one of the partners has HIV, and they want to have a baby, Hood says. These particles by themselves are actually very safe for sperm, for the same reason they are safe for vaginal cells. > While this work was done in cells in a laboratory environment, Hood and his colleagues say the nanoparticles are easy to manufacture in large enough quantities to supply them for future clinical trials. > This work was supported by the Bill & Melinda Gates Foundation Grand Challenges Explorations grant number OPP1024642 Fusogenic nanoparticles for combined anti-HIV/contraception. > Washington University School of Medicines 2,100 employed and volunteer faculty physicians also are the medical staff of Barnes-Jewish and St. Louis Childrens hospitals. The School of Medicine is one of the leading medical research, teaching and patient care institutions in the nation, currently ranked sixth in the nation by U.S. News & World Report. Through its affiliations with Barnes-Jewish and St. Louis Childrens hospitals, the School of Medicine is linked to BJC HealthCare. > Bee venom, a traditional medical treatment in some parts of the world, may become crucial to halting HIV/AIDS pandemic. > Bee venom, a traditional medical treatment in some parts of the world, may become crucial to halting the HIV/AIDS pandemic. 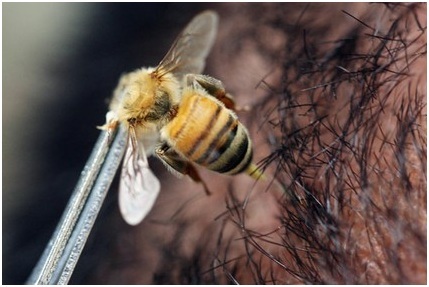 > Bees could hold the key to preventing HIV transmission. Researchers have discovered that bee venom kills the virus while leaving body cells unharmed, which could lead to an anti-HIV vaginal gel and other treatments. > Scientists at the Washington University School of Medicine in St. Louis found that melittin, a toxin found in bee venom, physically destroys the HIV virus, a breakthrough that could potentially lead to drugs that are immune to HIV resistance. The study was published Thursday in the journal Antiviral Therapy. > "Our hope is that in places where HIV is running rampant, people could use this as a preventative measure to stop the initial infection," Joshua Hood, one of the authors of the study, said in a statement. > The researchers attached melittin to nanoparticles that are physically smaller than HIV, which is smaller than body cells. The toxin rips holes in the virus' outer layer, destroying it, but the particles aren't large enough to damage body cells. > "Based on this finding, we propose that melittin-loaded nanoparticles are well-suited for use as topical vaginal HIV virucidal agents," they write. > Theoretically, the particles could also be injected into an HIV-positive person to eliminate the virus in the bloodstream. > Because the toxin attacks the virus' outer layer, the virus is likely unable to develop a resistance to the substance, which could make it more effective than other HIV drugs. > "Theoretically, melittin nanoparticles are not susceptible to HIV mutational resistance seen with standard HIV therapies," they write. "By disintegrating the [virus'] lipid envelope [it's] less likely to develop resistance to the melittin nanoparticles." > The group plans to soon test the gel in clinical trials. جميع الأوقات بتوقيت جرينتش +3 ساعات. الوقت الآن هو 07:17 مساءً الخميس 25 أبريل 2019.